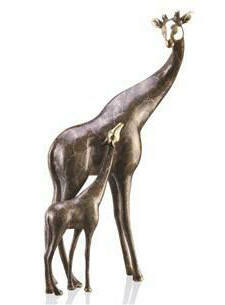 SPI Gallery, Giraffe Mama and Baby Sculpture in brass. Approximately 11.0"h x 6.5" x 4.0"d. Meticulously hand finished using hot patina technique. 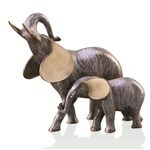 Perfect size to fit on any desk or shelf, this elegant cast brass piece will gather beautiful responses. SPI sticker attached.